Many Meyer E-60 owners know little about their E-60. We want to share a tid bit that few seem to know. 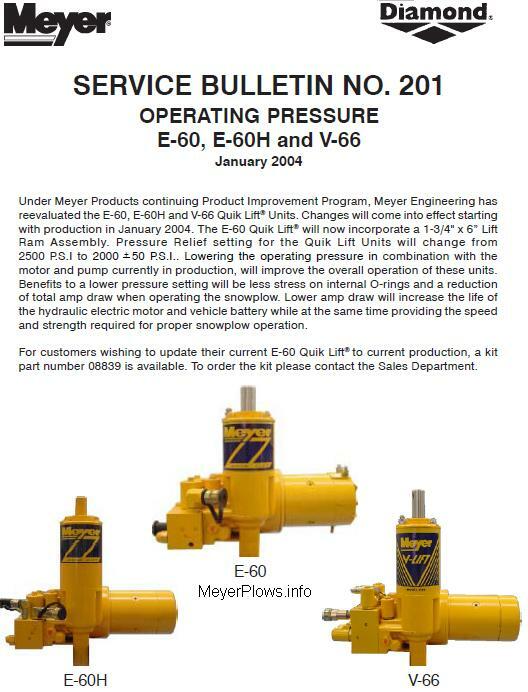 In January of 2004 Meyer issued a Service Bulletin stating that all new E-60, E-60H and V-66 units would have a new lower operating pressure. The pressure specification changed from 2500 psi, to 2000 psi. This was for a number of reasons. 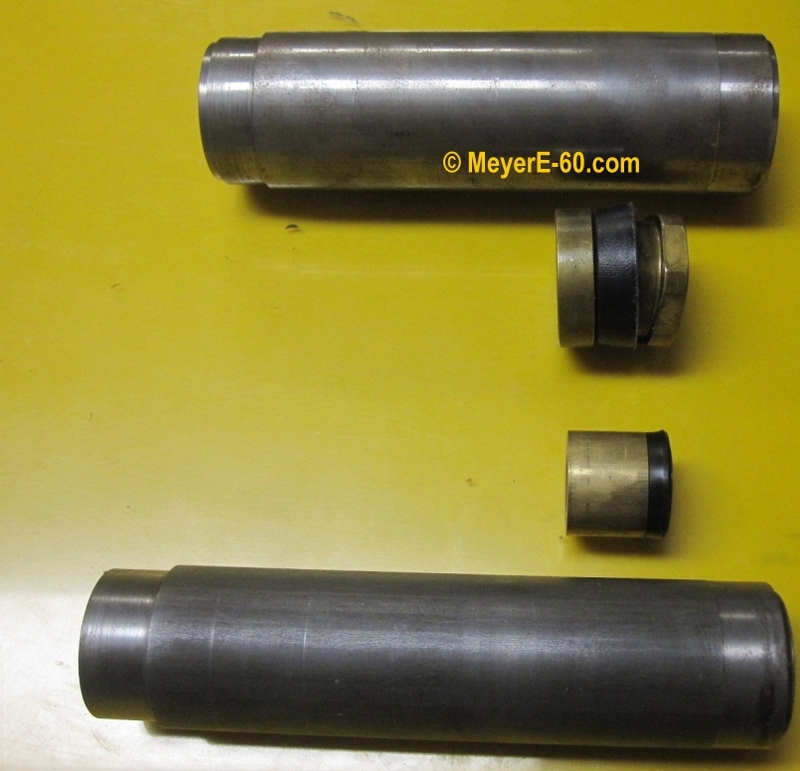 To make this change work with existing E-60 units, Meyer released a Cylinder Update Kit (Part# 08839) to reduce the operating pressure of the E-60 unit. The E-60H and the V-66 it was (is) a simple adjustment of the Pump Relief Valve setting to lower the pressure. Because the standard E-60 had such a small cylinder, it was necessary to release the Cylinder Update Kit. With the small diameter of the standard E-60 Cylinder, reducing the pressure would drastically reduce the performance, hence the larger diameter cylinder included in the Cylinder Update Kit. Here are some pictures showing the differences. 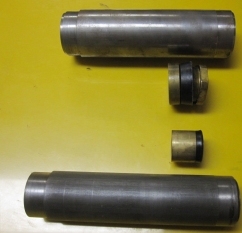 Pictured Top is an E-47 Cylinder. It is the same diameter as the cylinder included in the E-60 Cylinder Update Kit #08839. Pictured bottom is an original E-60 Cylinder. The original E-60 cylinder is on the left, along with the small brass Piston, and Packing Ring. The packing is not very durable, especially considering the original operating pressure of the E-60. The Cylinder Update Kit includes the same larger brass Piston, Packing Cup, and brass Follower on the right. These same parts were always used by the E-60H, and V-66. It is also used in ALL Meyer units from the discontinued E-46, right up to current production E Series pumps. Note the wall thickness of the original smaller diameter Cylinder. The larger diameter Cylinder is an E-47 that is upside down in the picture. 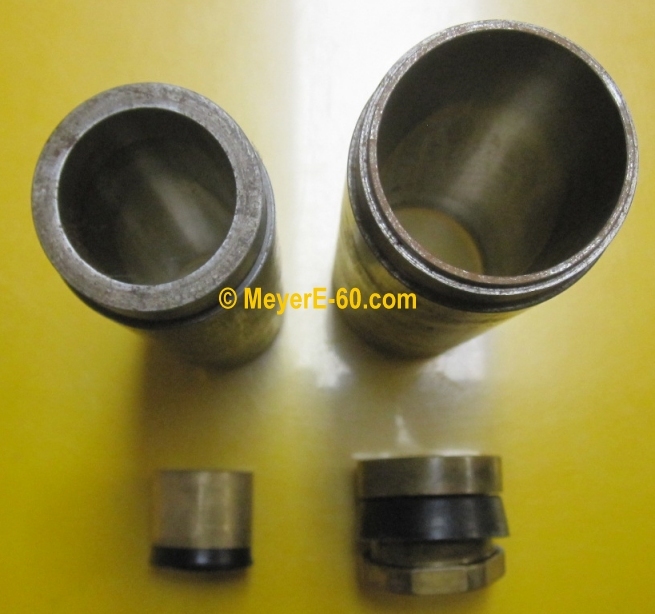 It is used for reference only as the 08839 Cylinder Update Kit includes the same diameter cylinder for the E-60. 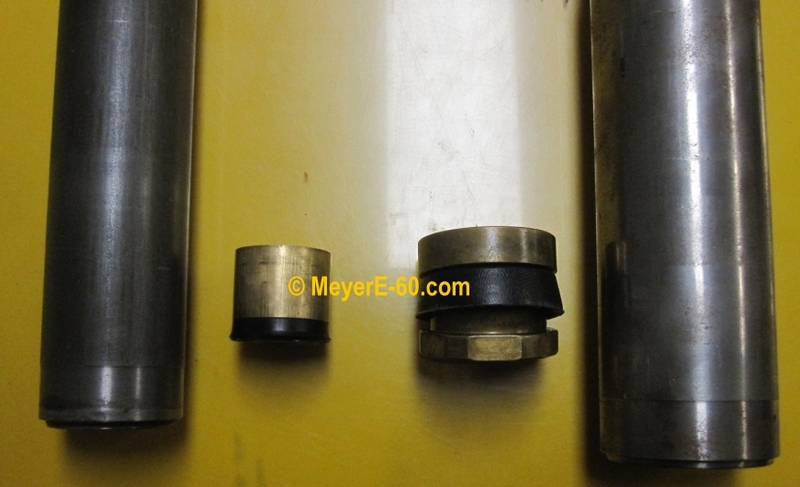 ALL Meyer E Series units use the same diameter Cylinder now. From the E-46 right up to current production units. Genuine Meyer E-60 Cylinder Update Kit. Increases Cylinder diameter to 1-3/4". Includes Seals, Cylinder, Piston, Follower. Pump pressure must be reset to 2000psi after install. DOES NOT FIT E-60H.